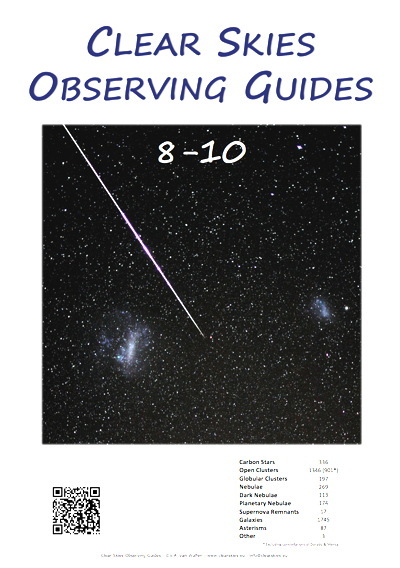 Victor van Wulfen provided a review copy of one of his Clear Skies Observing Guides, the "8-10" All sky edition". This guide (as with all of them) is a series of PDF files (vs. a single ebook) and was a 7.2 GB download. I was hoping the book would be readable on my iPad, and while the individual PDFs can be viewed on the iPad (or ereaders), the multiple, unlinked files are not conducive to being used on such devices. 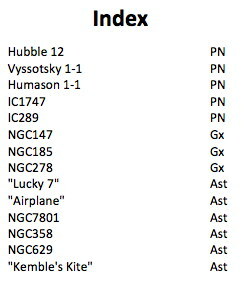 There are "Table of Contents" index files at each level, but since they are not linked, nor identify file names where each object listed can be found, using the indices are of somewhat limited value. 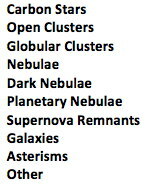 The content is organized by constellation, so once you know which constellation(s) has the object(s) you are interested in, you just navigate in your file browser to that folder. Once you get used to finding objects, the actual content is very useful. 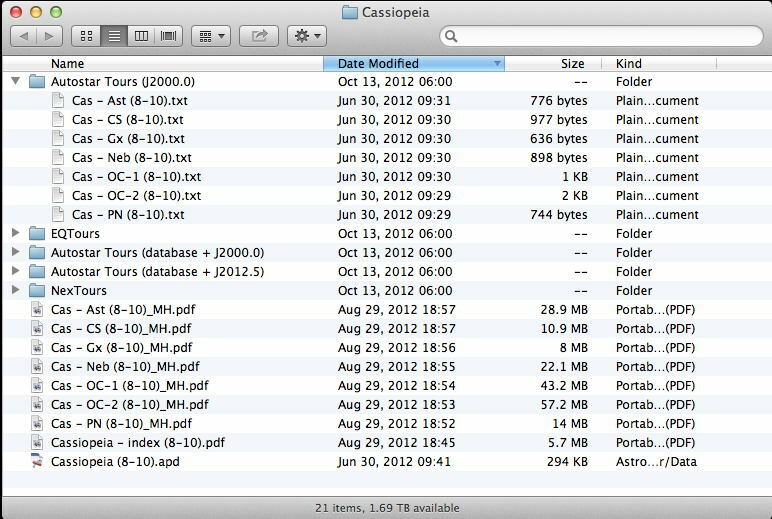 AUTO SELECT TEXT "Cassiopeia" """Planetary Nebulae""     Press MODE to start." in the eyepiece and hold down ENTER for more than two seconds. Release ENTER, verify the star is centered in the eyepiece, then press ENTER again." USER 23:26:18 +58d11m00s "Hubble 12" ""
USER 00:18:42 +53d53m00s "Vyssotsky 1-1" ""
USER 00:28:18 +55d58m00s "Humason 1-1" ""
USER 01:57:36 +63d19m18s "IC1747" ""
USER 03:10:19 +61d19m01s "IC289" ""
AUTO SELECT TEXT "Cassiopeia" """Planetary Nebulae""     The end of this Tour!" Due to the nearly Full Moon and the 8" aperture telescope used, I could not see any of the very faint and small planetary nebulae in the tour. 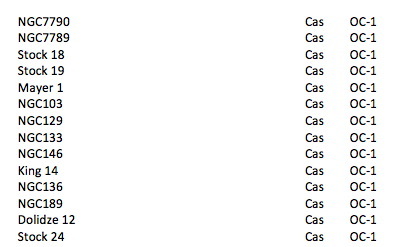 I did confirm the RA/Dec of the IC objects using the AutoStar database. While errors can always occur in any tour file, that should not deter you from trying out the CSOG tours. 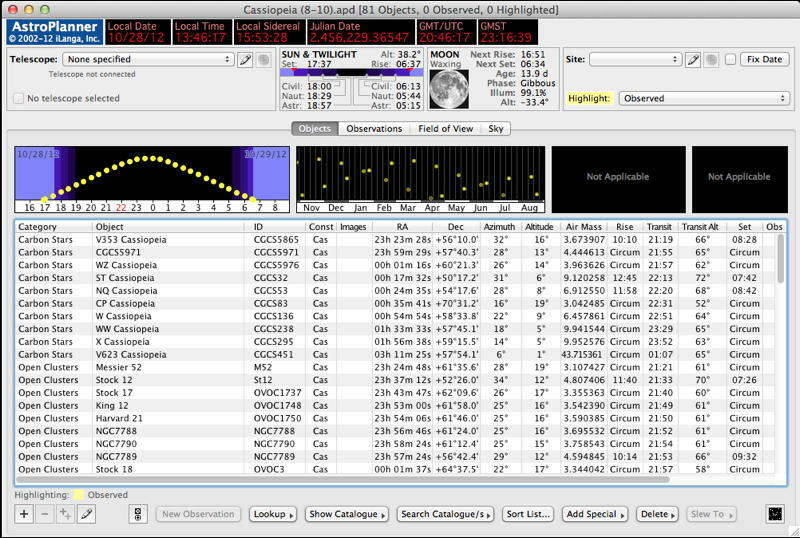 If you can deal with the manual search to locate the excellent content, the CSOG can be a valuable addition to your astronomical toolset, whether or not you use AstroPlanner or have a tour compatible telescope. I have recommended to the author that he link the files to make navigation of the PDF files a little simpler. However, that would be a major task considering all the content and files. It would also be nice to see an eBook version for use on compatible devices. There is a "user guide" available with a lot of helpful information, although this review has provided you with the information you need to use a CSOG.